"The person who will dig out our last iron ore has probably already been born"
"The person who will dig out the last shovel load of iron ore from WA has probably already been born. Based on the best available research, and relying on current levels of production, there is estimated to be 70 years worth of iron ore in the ground across the country. It’s better than gold — about 30 years — and copper — about a decade — but short of the 90 years worth of black coal or the 130 years of zinc thought to be hiding in the soil. Of course, technology and price rises should mean we will find more iron ore, but on the other side of the equation demand will also increase. You can’t start an iron ore or coal farm and grow more of the stuff. Once it’s gone, it’s gone for ever. As the Minerals Council of Australia recognises, taxing a resource at a flat rate is one of the worst ways to tax these commodities. That’s because the royalty hits before you even start production, which encourages the development of high-value minerals at the expense of others and hits hard those mines at the tail end of their existence. Royalties don’t care if iron ore prices are at $20 a tonne or $120 a tonne, and therein lies the problem with them. The Henry review, in a comparison of all types of taxes, found royalties were the worst type of tax in the country. For all Colin Barnett’s complaints about the resources super profits tax, his plans to increase royalty rates are also a substantial danger to the mining industry. Maybe not to a BHP or Rio Tinto, because of the huge revenue flows these two are generating, but to anyone else in the mining game. Mr Barnett wants to push up royalties because he recognises that royalty rates have not kept pace with the accelerating demand for the commodities. He has to look after the long-term finances of the State, and by signalling a royalty increase the Premier is effectively admitting WA has been giving away its non-renewable resources to private companies far too cheaply. When the iron ore runs out, BHP, Rio, FMG and others will head off to other parts of the globe in search of resources. The Premier is doing the right thing by the taxpayers of WA by seeking to increase the payments for commodities that can never be recovered. However, the royalties system is a terrible way to do it because of the wider economic damage it causes. That’s the whole reason behind moving from royalties to a system that taxes profits, and grabs a constant share of those profits. Unfortunately, the Rudd Government has seemingly stuffed up this whole issue from the very beginning. Some of the Government’s arguments have been disingenuous to the point of outright lying. Just the name of the tax — the resources super profits tax — is a piece of political spin and nothing else. It’s all about tapping anger in urban parts of the country over the Government’s claims that miners don’t pay their fair share of tax. Really, this is an onshore minerals rent tax and nothing more. The Henry review suggested excluding certain low value minerals such as peat, talc, lime and sand, largely because any financial benefits would be outweighed by the administration costs and the fact these minerals don’t generate very large profits. Instead, the Government brought them under the super profits umbrella, with no explanation. It has welched on a confrontation with the States over royalties. Even with all the evidence that royalties are a bad way to tax non-renewable resources, the Government went with a second best option of leaving the States to collect royalties and then rebate them back to the companies involved. In the selling of the whole change, Ken Henry was not rolled out until a fortnight after the report was made public. The person best placed to explain the tax was held in reserve, while other members of his panel were not asked to front the cameras to explain how the tax would work. And attempts to explain how the rent tax would work made the plot lines TV’s Lost seem simple by comparison. Mr Rudd failed to sell the ETS and his ham-fisted efforts at the RSPT have been no better. Apart from Dr Henry and a few tax experts, no one seems to be able to explain, without a power point presentation why the tax kicks in at such a low level. The fact this tax does not operate anywhere else in the world is also of little comfort. As Ross Garnaut, one of the fathers of rent taxes in this country who is also the chairman of gold miner Lihir Gold, explained recently, making the theoretical case is one thing. He argued that unless every element of the theoretical argument could be borne out, then the best option would be the introduction of the petroleum resource rent tax to the onshore mineral sector and one other minor change. I think he has it about right, and it’s an option that should be pursued by the Government. The PRRT is understood, its arrangements have not changed since it was introduced more than 20 years ago. A key element of any tax system is that it should not change over time. 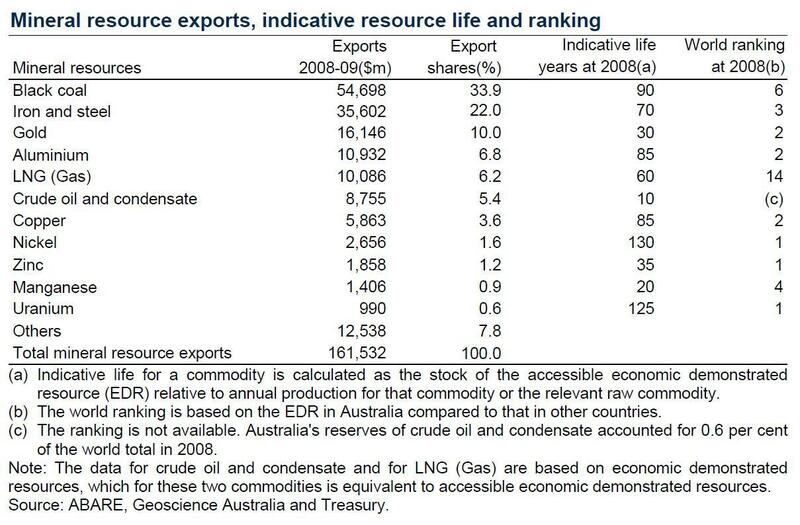 The fact oil and gas are still being taken from Bass Strait is a testament to the success of the PRRT. Under the previous system of excises, BHP and Esso, the two firms behind Bass Strait, would have wound up production almost two decades ago. The main selling point of the RSPT over the petroleum tax — the Government taking 40 per cent of the risk in a project — is simply not valued by the companies. That is a major problem. Of course, the Government is no orphan being disingenuous in their argument. Mining companies claim that royalties are a tax, but on their annual accounts they are accounted as a business cost and so are tax deductible. The royalty is a fee for digging up the dirt — without some sort of fee, the owners (us) would be giving away a non-renewable resource that is worth money for free. The RSPT replaces the royalty to become the fee, and so rises and falls with the movement in price. That is what sets it apart from a royalty, and why it is a much better tax. None of this, however, detracts from the main point — the RSPT will collect a lot more tax from a few key mining companies. Taking $10 billion or so a year from their bottom lines must have an impact on the operation of the sector right now. Some projects seem likely to be delayed for many years to come, although eventually the value of WA’s commodities will demand their exploitation. Maybe the person destined to be the last to dig iron ore out of WA has a little more time up their sleeve."
. Frijters: Who wins? Who loses? To quote one YouTube commenter: This should be Australia's national anthem. And guess what? It's no longer the ABC's News theme. But given that the new one scarcely registers, they should bring it back. The band is called Pendulum. They're from Perth. Labels: media, music, popular culture, videos. The mining industry did not save Australia from recession as is widely believed, according to the head of the Treasury. And any investor who thinks the proposed new tax is causing stock market jitters deserves to do their dough. In two hours of calm, defiant and at times barbed evidence to a Senate committee just ahead of leaving on an overseas holiday Treasury boss Ken Henry rubbished claims the mining industry was Australia's Saviour, poured scorn on suggestions that it was highly taxed and inferred that what its executives say in private they don't repeat in public. Asked whether the government was planning to water down the proposed new tax in response to industry concerns he said he was aware of no such proposal. Asked whether he still expected mining investment to boom as forecast in the budget he said he had seen nothing to make him change his mind. Turning to the industry's role in the economy he said he had "lost count of the number of times" he had heard people say it saved Australia from recession. "These statements are not supported by facts," he added. "It is true that Australia avoided a recession... but the Australian mining industry actually experienced quite a deep recession. In the first six months of 2009 it shed 15 per cent of its workers. Mining investment collapsed, mining output collapsed." "Had every industry behaved that way our unemployment rate would have climbed to 19 per cent." As industry claim that Tax Office data showed it paid tax at around the rate of 30 per cent was "not very surprising and not very meaningful". "Tax payable divided by taxable income will of course come close to the statutory rate." 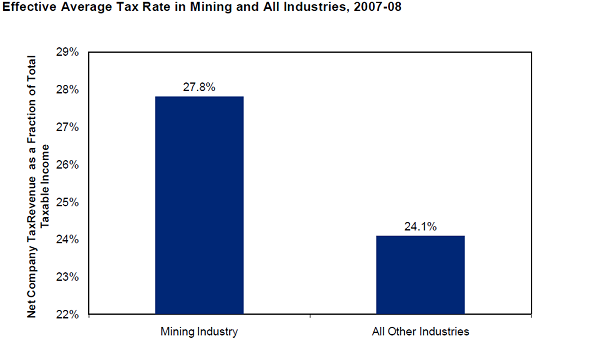 "But the mining sector is a very significant beneficiary of very large concessions that cut its taxable income to a fraction of its total income." "We could remove all those concessions and not change the industry's claimed tax rate but I am sure it would regard the removal as significant." Claims by industry executives that they were shelving or putting on hold investments because of the proposed tax needed to be taken with a grain of salt. "There are always questions about when specific investments will be undertaken." "Recently the chief executive of one rather large company said to me, by the way this was before the announcement of the tax, that he had 30 or 40 years work in these projects on the table". 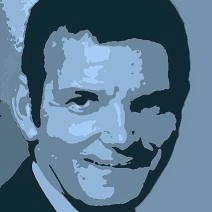 "Today to hear the same mining executive talk you would think that his expectations had been that all of these projects were going to be rolled out next year." "Frankly there is more than enough investment in train in the mining sector. The limit is access to the labour and capital needed to undertake the projects." "Some companies in the west have fly-in fly-out arrangements form eastern capital cities. That tells you there's a supply constraint." Asked whether the proposed 40 per cent super profits tax rate would harm investment he said if the rate was 70 or 80 per cent it would make no difference. "In concept anything short of 100 per cent would make no difference." "I don't want to make too much of this but other countries such as Norway have managed to attract substantial investment taking 95 per cent of the profits." Asked whether the proposed tax had hurt share prices he said there was "a lot of volatility out there", but that "people who really believe that share price volatility is due to the tax stand to lose some money I would suggest." KEN Henry made the most of his reluctant appearance before a Senate committee. He put down his critics, and gave a lucid explanation of his resource rent tax offset only by an own goal and one sharp senator getting through his defences. The Treasury boss had it easy as Coalition senators virtually invited him to explain how the tax would work, why it was needed, and what were the flaws in the arguments against it. He challenged the Minerals Council's claim that miners pay 41 per cent of their income in tax and royalties, rising to 58 per cent in the new scheme. Yes, he said, on their taxable income but only because tax breaks for depreciation made their taxable income "a fraction of their economic income". "It's not very meaningful," he said. "We could remove all the mining industry's tax concessions and not change its effective rate of tax calculated [that] way." Yet losing billions of dollars a year in tax breaks would be "of some significance". And yes, under the new scheme, in theory a company could have to pay tax as high as 56.8 per cent of its taxable income. But it would do that only if its profits were "infinitely high". On Treasury estimates, only companies earning returns of more than 25 per cent a year would pay 50 per cent of their income in tax. Henry said he knew of no decisions to change the tax, despite speculation that the government will lift the threshold for resource profits from 6 per cent to 11 per cent. But he hinted darkly that if it did, there could be other changes to claw back the revenue loss. But he kicked one own goal, claiming that, far from the mining industry "saving Australia from recession", the truth was the reverse: mining had "quite a deep recession", yet Australia had none. Mining shed 15 per cent of its employees, he said. Bunk. The seasonally adjusted jobs figures are not reliable at that level. They show that mining jobs rose 30 per cent in the last nine months of 2008, then shrank 15 per cent in six months, then rose another 15 per cent. How can anyone believe that when the national accounts show mining output in 2009 was basically flat, with at most a brief fall of 1.2 per cent? Then, under persistent questioning from independent Nick Xenophon, Henry conceded that the optimistic modelling of the tax ignored the prospect that mi.ning projects could be deferred in response to the tax, to focus on the (very) long-term benefits. "Frankly, there is more than enough investment in train in the mining sector," he said. That's right, 7.50 am, for two hours. It'll will be broadcast live here. The spending cuts proposed by the Coalition in its reply to the budget pose a risk to the management of the economy and could endanger the working of the public service according to the head of the Department of Finance. Appearing before a Senate estimates committee Department head David Tune was asked about the effect of a two-year freeze on public service recruitment along the lines proposed by the Opposition. capacity to project manage construction would be affected." The Finance Department loses 11 per cent of its employees each year... and relies on graduates to "renew our thinking and keep us rejuvenating". "While the effect would not necessarily be immediate in year one or year two, losing an entire cadre of graduates would effect down the track," he said. The department would give the highest priority to complying with its legal obligations , but would face problems if it was unable to replace senior economists and accountants as they left and may have to adopt lower service standards, something that would be "regrettable". A related Coalition's proposal to cut a further $350 million cut in travel spending on top of cuts just negotiated would cause problems as those contracts can not yet be reopened. The only way to do it would be to cut the number of flights 17 per cent, most probably "rationing" department by department. Mr Tune said the department had been given just one week to cost the Building the Education Revolution school stimulus program. It arrived at the costing in an "unscientific" way but would probably not have reached a different conclusion if it had had longer. Try to get out, if you can. online, figuring rightly that there is money and power in being the place where people define themselves. These are all quotes from this blog. including the city you live in, your name, your photo, the names of your friends and the causes you have signed on to. employment information, reading preference, schools—all made public.
. So you think "adult" sites are the most popular on the web? Labor has good reason not to fear an electoral assault from the mining industry. A Herald analysis of the 13 Labor-held seats in mining regions shows all but 4 are held by massive margins. Cunningham taking in Wollongong, Bulli and Helensburgh is held by an impressive 17 per cent. Labor's weakest margin in NSW is in Charlton which labor's rising star Greg Combet holds by 12.9 per cent. 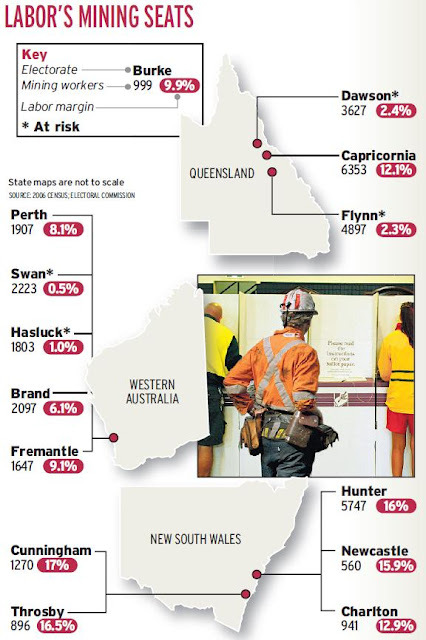 Only two seats in Queensland two in Western Australia are held by less than 3 per cent. What's also notable is how few mining workers are actually employed in those seats. In most it is fewer than 2000. And not all of them are well-disposed toward their employers. In recent years Rio and BHP have been shedding staff. In the 1990s the Gordonstone mine in Queensland used security guards and dogs to lock-out sacked workers.
. A win for economics, a win for parliament, a win for my suburb.. The Minerals Council quoted me here, Swan quoted me here.